While we always hope that the Jalopnik Bump results in a win, sometimes we’re impressed enough with a team merely finishing the race. 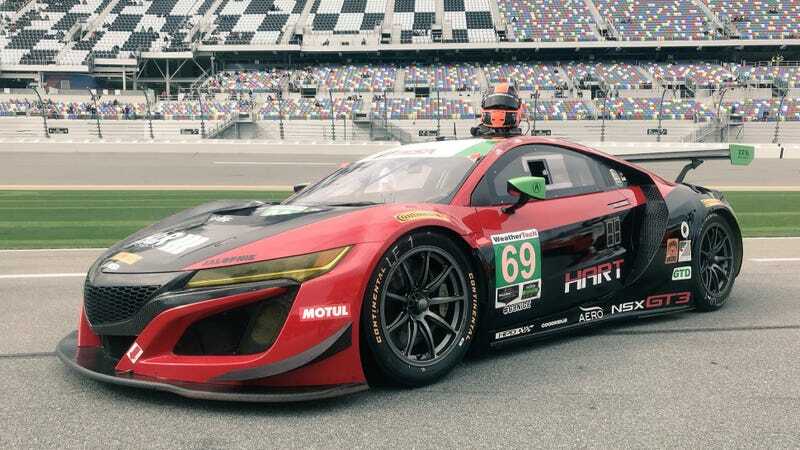 The Honda of America Racing Team (HART, for short) works in prep for their Acura NSX GT3 around regular nine-to-five day jobs at Honda’s headquarters in Ohio, and they actually finished their first-ever shot at the full 24 Hours of Daytona. Better yet, this volunteer-run team—think like your office’s softball league, except a whole lot cooler—didn’t even finish last. They finished 16th in the 21-car GT Daytona class, which was perhaps the closest field of all three classes at Daytona. At times, they ran as high as fourth in the class, however, the unforgiving nature of Daytona eventually caught up to them. With a little over eight hours left in the race, they had a front left suspension failure that forced them into the garage for a quick but costly repair—and also forced them down the standings. A small pit lane violation later gave them a stop and hold penalty that ate up three minutes—sitting there. But at the end of the race, they crossed the finish line with the Jalopnik bump intact. And now it’s back to work, haha.